the Cards' organization is spinning this into a collective fan decision. That's dodging a public relations bullet. Actually, all this hat stuff is cabin fever nagging. 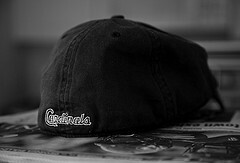 Once the season starts, the drama on the diamond should set this "hat" on the hot stove's back burner.